As White Rock Fire Fighters, the members of Local 2407 have a proud history of fundraising in our community. With the support of the City of White Rock Fire Department, the White Rock Fire Fighters Charity Association has dedicated thousands of hours of off duty time in support of charities in White Rock, South Surrey, and the Lower Mainland. 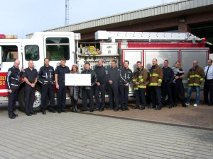 The White Rock Fire Fighters also operate a Victim’s Assistance Fund. This fund is used to help support families in our community that have suffered a substantial personal loss due to fire. The Victim’s Assistance Fund helps to aid individuals with temporary housing, meals, and travel after a personal tragedy.